Illustrious Chittorgarh Fort was the capital of the world's longest ruling dynasty, the kingdom of Mewar, for an expansive eight centuries. Not only is it regarded as the greatest fort in Rajasthan, it's one of the most sizable forts in India and a UNESCO World Heritage Site. The fort was the scene of many dramatic and tragic events during its time, some of which served as inspiration for the controversial 2018 Indian period drama movie "Padmaavat" (based on an epic poem that recounts the legend of Queen Padmavati, wife of 14th century monarch Maharawal Ratan Singh). 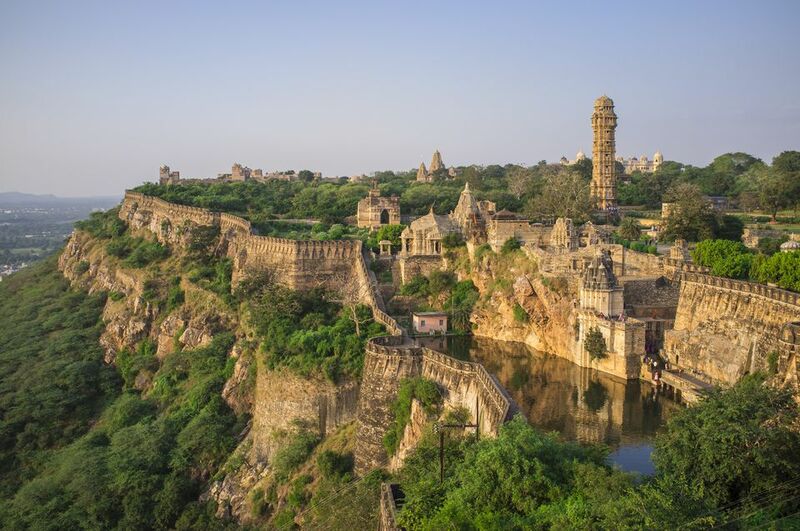 Learn more about the compelling history of Chittorgarh Fort and how to visit it in this guide. The origin of Chittorgarh Fort can be traced back to the 7th century, when Chitrangad Mori of the Maurya dynasty is said to have laid its foundation. The fort came into the possession of Bappa Rawal, who established the Mewar dynasty, in the mid 8th century. However, there are conflicting accounts of how it happened. Either he received the fort as a dowry gift, or seized it in battle. Nevertheless, he made the fort the capital of his extensive new kingdom, which stretched all the way from Gujarat state to Ajmer, in 734. All was well until 1303, when the fort was attacked for the first time by Allaudin Khilji, brutal ruler of the Delhi Sultanate. Was it because he wanted the strong and strategically-positioned fort for himself? Or, as per to folklore, was it because he desired the king's gorgeous wife Padmavati (Padmini) and wanted her for his harem? Regardless, the outcome was devastating. About 30,000 of the fort's occupants were murdered, the king was either captured or killed in battle, and Padmavati immolated herself (along with the other royal women) to avoid being dishonored by Allaudin Khilji and his army. The Mewars managed to reclaim the Chittorgarh Fort and re-establish the rule of their kingdom there in 1326. Rana Kumbha strengthened most of the fort's walls during his reign from 1433 to 1468. The second attack on the fort took place a couple of centuries later in 1535, by Sultan Bahadur Shah of Gujarat who was keen to expand his territory. By that time, the Mewar rulers had developed their kingdom into a military force to be reckoned with. It didn't stop the Sultan from winning the battle though. Although the king's widowed mother, Rani Karnavati, appealed to Mughal Emperor Humayun for help, it didn't arrive in time. The king and his brother, Udai Singh II, escaped. However, it's said that 13,000 women collectively immolated themselves in preference to surrender. It was a short-lived victory because Emperor Humayun quickly expelled the Sultan from Chittorgarh and reinstated the inexperienced young Mewar king, Rana Vikramaditya, perhaps thinking he could easily manipulate him. However, unlike many Rajput rulers, the Mewars didn't submit to the Mughals. Pressure was applied, in the form of a grueling attack on the fort by Mughal Emperor Akbar in 1567. His army had to dig tunnels to reach the fort walls, and then blast the walls with mines and cannons to breach them, but finally succeed in taking over the fort in 1568. Rana Udai Singh II had already made his getaway, leaving the fort in the hands of his chieftains. Tens of thousands of common folk were slaughtered by Akbar's army and another round of mass immolation was committed by Rajput women inside the fort. The Mewar capital was subsequently re-established in Udaipur (where the royal family continues to live and has converted part of their palace into a museum). Akbar's eldest son, Jehangir, ended up giving the fort back to the Mewars in 1616 as part of a peaceful alliance treaty. However, the terms of the treaty prevented them from carrying out any repair or reconstruction works. Later on, Maharana Fateh Singh added a few palace structures during his reign from 1884 to 1930. Locals have built homes inside the fort though, forming a whole village within its walls. Chittorgarh Fort is spread across 700 acres atop a 180 meter (590 foot) high hill about two hours northeast of Udaipur, in the southern part of Rajasthan state. The hill and fort are situated near the Gambhiri River, making the setting particularly spectacular. The fort is ideally visited on a day trip or side trip from Udaipur, where the nearest airport is located. The most convenient way of getting there is to hire a car and driver from one of the many travel agencies in Udaipur (expect to pay around 3,500 rupees for a full day) and take National Highway 27. Those who are traveling on a budget may prefer to go by train to Chittorgarh. If you don't mind getting an early start (which is a good idea to avoid the searing heat), the 12991/Udaipur City - Jaipur Intercity Express departs Udaipur at 6 a.m. and arrives in Chittorgarh at 8 a.m. Expect to pay about 200 rupees to get an auto rickshaw from the train station to the fort. Shared autos are available for less. To return to Udaipur, catch the 12992/Jaipur-Udaipur City Intercity Express back at 7.05 p.m. Alternatively, if you'd prefer an earlier afternoon departure, there are a number of other trains to choose from. The Palace on Wheels and Royal Rajasthan on Wheels luxury trains also stop at Chittorgarh. Chittorgarh Fort is free to enter and open all the time. However, you'll need to buy a ticket if you want to visit a few specific monuments such as Padmini Palace (the main attraction). The cost is 40 rupees for Indians and 600 rupees for foreigners. Admission is from 9.30 a.m. to 5 p.m. (last entry) daily. The fort's substantial size will require you to have some sort of transport to get around. If you don't have your own car, you can hire a bicycle or auto rickshaw for the day. These are available from near the ticket counter, along with tourist guides. If you decide to hire a guide, make sure you bargain and choose well. Their rates and knowledge are variable. Allow a minimum of three to four hours to see the important monuments. They're all marked on Google Maps, which provides an easy way of navigating. Ideally, time your visit to enjoy sunset at the fort too. September through to March are the best months to visit the fort, as the summer heat (from April to June) is quite savage and this is followed by the monsoon season up until the end of August. Chittorgarh doesn't receive much rain, so it remains uncomfortably hot throughout the monsoon. Make sure you have sun protection such as a hat, sunscreen, and comfortable walking shoes. Do note that there are monkeys inside the fort. They tend to behave themselves but can be unpredictable and are hence best avoided. In addition, the fact that the fort is free to enter means that a lot of locals hang out there. Females, especially foreigners, may receive unwanted attention and feel uncomfortable at times. If you'd prefer to stay in Chittorgarh rather than visit it on a day trip, Chittorgarh Fort Haveli is a decent budget option that's located inside the fort walls near Rampole Gate. Rates range from 1,500 to 2,500 rupees ($20 to $34) per night for a double. The superbly refurbished Padmini Haveli Guesthhome, in the village inside the fort, is also a wonderful place to stay. Expect to pay 3,500 to 4,500 rupees per night, including breakfast. Padmini Havel has a rooftop restaurant that serves delicious vegetarian Rajasthani fare. It's a refreshing spot to end the day, or have lunch. Entering the fort is an experience in itself, as you'll pass through seven massive fortified stone gates called pols. The fort is in the process of being restored and renovated, with the works expected to be completed by 2020. Until then, unfortunately not all of it is accessible. Padmini Palace, not surprisingly, draws the biggest crowd. This white, three-story building is actually a 19th century replica of what Queen Padmavati's original abode may have looked like. Maharana Sajjan Singh ordered it to be constructed in 1880. Unfortunately, much of it is dilapidated. Most people visit it only because of the famous legend connected to it. The fort's other authentic places are worth seeing more. The sprawling 15th century palace of Rana Kumbha is the largest structure in the fort and hints of how glorious his reign must've been. Rana Ratan Singh II's evocative palace was added in the 16th century and sits secluded by a lake on the far northern side of the fort. Its location, away from the central monument area, means it's less crowded and a great place for photography. The fort has two distinctive landmark towers—Vijay Stambha (the Tower of Victory) erected by Rana Kumbha to mark his triumph over Mohammed Khilji of Malwa in the 15th century, and the 12th century Kirti Stambha (the Tower of Fame) built by a Jain merchant to exalt the first Jain tirthankara (spiritual teacher) Adinath. The fort's multitude of water bodies, to sustain a vast army, are of interest. The major one is picturesque Gaumukh reservoir on the western side of the fort, not far from Vijay Stambha. It's considered to be sacred by locals and has fish in it that you can feed. Chittorgarh Fort is also associated with another renowned historical figure in India, Meera Bai, a spiritual poet and devout follower of Lord Krishna. She married Mewar prince Bhojraj Singh in the early 16th century. After he was killed in war, it's said that she refused to commit sati (throw herself on his funeral pyre) and moved to Vrindavan to further her devotion to Lord Krishna. The Meera temple near Vijay Stambha is dedicated to her. There are numerous other well-maintained temples to see, including some magnificent intricately-carved Jain temples. The place where royal cremations happened, known as Maha Sati, is a grassy ground below Vijay Stambha. Apparently, it's where the royal Rajput women immolated themselves as well. Rajput women hold an annual Jauhar Mela procession inside the fort in every February to commemorate the bravery of their ancestors who chose this death before dishonor. If you're keen to hear stories about the fort's history and characters involved in it, you may wish to stay back to attend the evening sound and light show at the fort. There's enough to do in the area to occupy a full day. It you want to go shopping, avoid buying anything inside Chittorgarh fort (you'll pay too much and/or get poor quality products). Instead, trawl the markets in Chittorgarh town. Popular ones are Sadar Bazaar, Rana Sanga Market, Fort Road Market, and Gandhi Chowk. You'll find an array of goods including metalwork, textiles, miniature paintings, traditional Thewa jewelry, leather shoes, puppets, and handmade toys. Akola printed fabrics, made from vegetable dyes, are a specialty of the region. Nagri, about 25 minutes northeast of Chittorgarh alongside the Bairach River, was an important ancient town known as Madhyamika. Excavations have found punch-marked coins there that are believed to date as far back as about the 6th century BC. Rajasthan's oldest Vishnu temple, from the 2nd century BC, was also uncovered at Nagri. The town flourished during the Mauyan and Gupta periods, and remained an important religious center up to the 7th century. It's in ruins now, although old coins apparently still turn up. There are more things to see in Bassi village, about 15 minutes further on from Nagri. Handicrafts such as sculptures, pottery and woodwork are a highlight. Other attractions are temples, step wells and cenotaphs. If you're traveling by road from Udaipur to Chittorgarh, Sanwariyaji temple dedicated to Lord Krishna, can be visited on the highway about 50 minutes from Chittorgarh. It was recently grandly rebuilt and looks captivating.